Named after an old chain gang work song about the light of a passing train being a symbol of redemption, Jeff Nichols’ (“Mud”) Midnight Special is an enigmatic science-fiction thriller about a boy with special powers and his parents whose bridge of love between them knows no worldly boundaries. Set in the American South, the film pays homage to popular sci-fi movies of the late 70s and early 80s, but never reaches the heights of their enchantment. Opening in a dark motel room with windows boarded shut, an Amber Alert is announced on an old tube television, telling us that an eight-year-old boy has been kidnapped. In the room, the slight boy, Alton (Jaeden Lieberher, “St. Vincent”) sits between two beds wearing night-vision goggles but shows no emotion as he is abruptly put in the back seat of a 1972 Chevelle by two older men who look like kidnappers in a big hurry. We soon learn that the two men are Roy Tomlin (Michael Shannon, “Take Shelter”), Alton’s biological father and Roy’s close friend Lucas (Joel Edgerton, “Black Mass”), a State Trooper he has known since childhood. We shift to a Texas religious community known as the Third Heaven Ranch, where we learn that the boy was raised by the Ranch’s charismatic leader, Calvin Meyer, (Sam Shepard, “August: Osage County”). Entranced by the streams of blue light that radiate from the boys’ eyes, Meyer and his flock believe that Alton is a spiritual being, a savior who can lead the world to a spiritual renaissance. As the FBI suddenly storms into the church, asking everyone in attendance to submit to questioning because of a sudden large purchase of guns, it is clear that the FBI, the local police, and NSA operatives — because of his ability to read secret codes and coordinates — see the boy not as a savior but as a security threat. On the run, Roy and Lucas are soon joined by the boy’s mother Sarah (Kirsten Dunst, “Melancholia”) who is thrilled to see her son again. Looking at comic books in the back seat, Alton is wearing goggles to control the beams of blinding light that emanate from his eyes when he is upset and headphones to drown out the radio and satellite transmissions he hears in his head. Pursued by federal agents, as well as by NSA operative Sevier (Adam Driver, “Star Wars: Episode VII – The Force Awakens”), Roy will stop at nothing to deliver his son to his destination. Cinematographer Adam Stone fully captures the mood of the lonely back roads of the South where they drive, seeking a location known only to Alton. His health is failing and there is little time left to fulfill his destiny. According to Nichols, “They’re on the run, they’re being hunted and, at the same time, they’re racing towards something important, though we don’t immediately know what it is.” It may also be that we are not supposed to know but must simply surrender to the unknown and unknowable nature of the world we find ourselves in. Assisted by the powerful original score of David Wingo, our understanding expands little by little as the tension increases, but there are always more questions than answers. In a masterful set-piece, as they stop for gas, Alton gets out of the car against Roy’s instructions beams of light from his eyes cause a satellite to explode doing massive damage to the gas station. Midnight Special is a chase movie, a family drama, and a story of reaching to worlds beyond our power to grasp. While it bravely suggests that we can evolve and be greater than we are now, questions come to mind about whether Alton’s special powers could have been used to benefit people on Earth, end sickness, wars, and hatred or prepare people on Earth for the next step in evolution which he represents. Nichols respects his audience and does not spoon feed us with voice-overs or emotional cues, yet we never really get to know any of the characters to the point that we care about them and the film’s deliberate obscurity keeps us more distracted than involved. 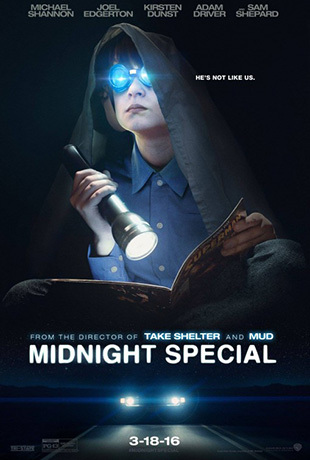 Marred by a derivative and too literal ending, Midnight Special strives for profundity but lacks the emotional resonance that makes for a truly profound experience.